The 2016 referendum saw the UK vote, by a very small majority, to leave the European Union. However, in the months since, there has been no clear answer to the question of how and on what terms the country should make its departure. With the UK currently tied to the EU’s REACH Regulation, the result of the referendum has caused inevitable concern among stakeholders within the chemicals industry. And a succession of parliamentary debates and votes have only served to prolong the considerable uncertainty industry is facing. Chemical Watch has closely tracked the conversation around Brexit since the referendum took place on 23 June 2016. It is work for which we proudly received a SIPA award in 2018. We’ve spoken to trade bodies, chemicals agencies, government departments, EU bodies, consultants, MPs, members of the House of Lords and NGOs to help you understand the state of play, and give you an idea of what to expect as a result of Brexit. 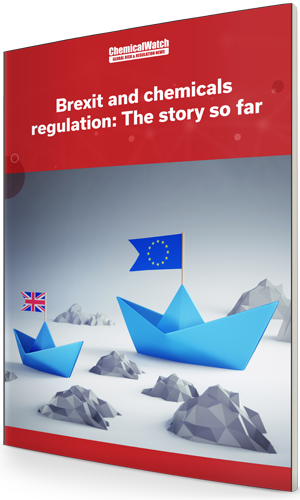 This report brings together some of our most important coverage, looking at issues such as the UK's future relationship with Echa, the potential consequences of a no-deal Brexit, and the possible cost implications of Brexit for industry. It will give you the chance to look back at how the conversation has evolved since June 2016. The report is free to download – you’ll just need to register first if you don’t already have a Chemical Watch account. To see a full, up-to-date list of all our Brexit coverage, click here.